It’s starting to feel like summer is ending already. I’m sure it’ll be summer temps here in MD until October, but with school starting again in a few weeks and some mild weather we’ve been having I am looking ahead to the fall. But first lets take a look at the adorable little bathing suit I made for Bean this summer. 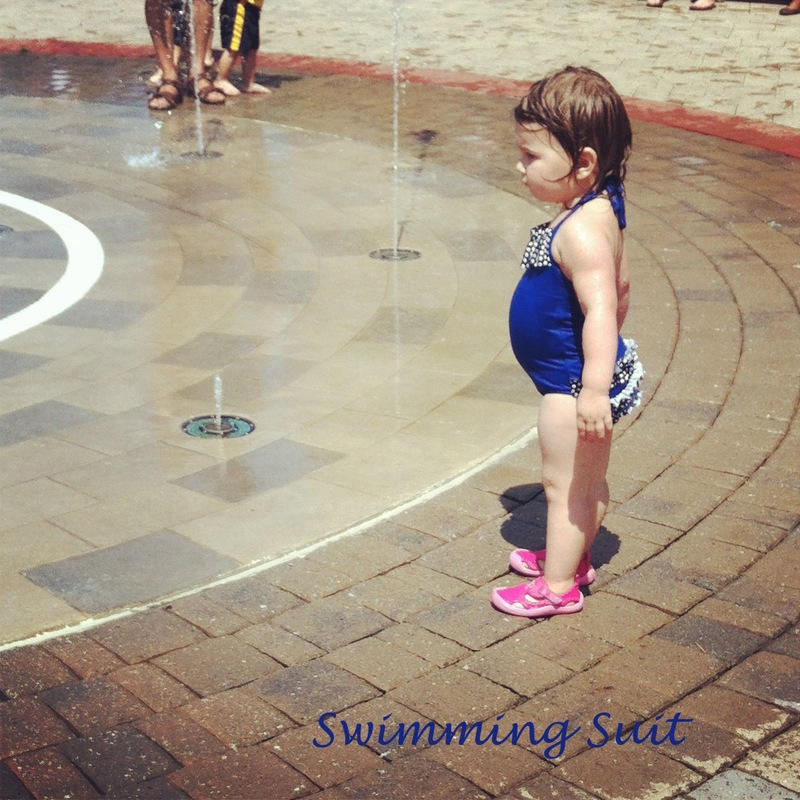 The pattern is the Waikiki One Piece from Peek A Boo Pattern Shop (affiliate link). They have a few bathing suit styles, but this was the one that immediately caught my eye. I think it was the ruffles on the bum, hehe. My local JoAnn Fabrics didn’t have a great selection of swimsuit fabric so it took me a while to figure out what colors I would use. I ended up buying a gigantic ladies tank from a different chain store (which I detest so I won’t mention the name, hehe) that had the cute polka dotted fabric. I knew once I had the polka dots that I could find a basic color at the fabric store, so things started to come together. It seemed most of the fabric was meant for the stage (as in your eyes may be blinded if you look at it any closer than 50ft away) so I decided to use the reverse side of this bright blue which was slightly more subdued and way less shiny that the “right” side. The suit is fully lined (part of the pattern instructions) so I wasn’t worried about that shiny stuff scratching against Bean’s skin. Of course all of this was ready and cut out before Bean’s birthday in May, but I didn’t ACTUALLY sew it until almost July. June was such a rainy terrible weather month that it never moved up my list of must sews. But once I actually started sewing, it came together so quickly (maybe an hour) it was foolish not to have finished it sooner. Now here’s the sad part. 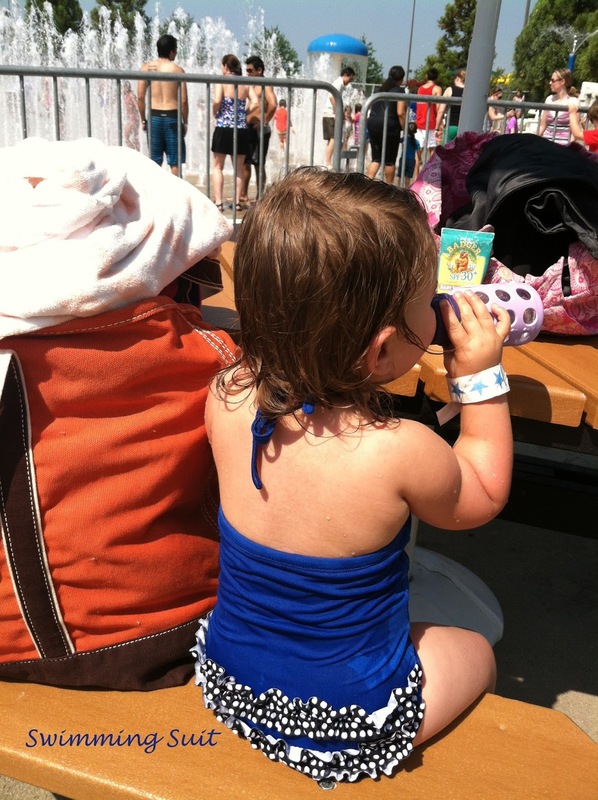 Bean hasn’t even been swimming once this summer. 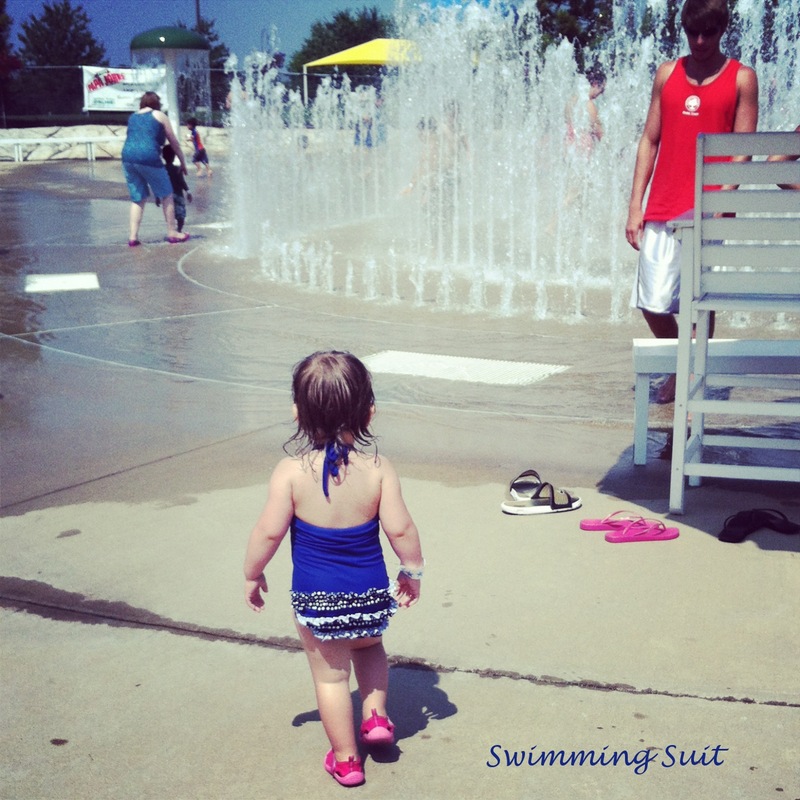 We have gone to the fountain in her bathing suit twice and then to the splash park a whopping one time. Oh, and when my sister was visiting we filled up her kiddy pool so she could splash for 15 minutes before the mosquitoes tried to devour her. We planned to go to the beach when we took our trip to MA a few weeks ago, but the 60 degree temperatures quickly squashed that idea. It’s been that kind of a summer. Luckily she’s still young enough that she won’t remember the summer her mother didn’t make her swimming suit until July and she only got to wear it four times. 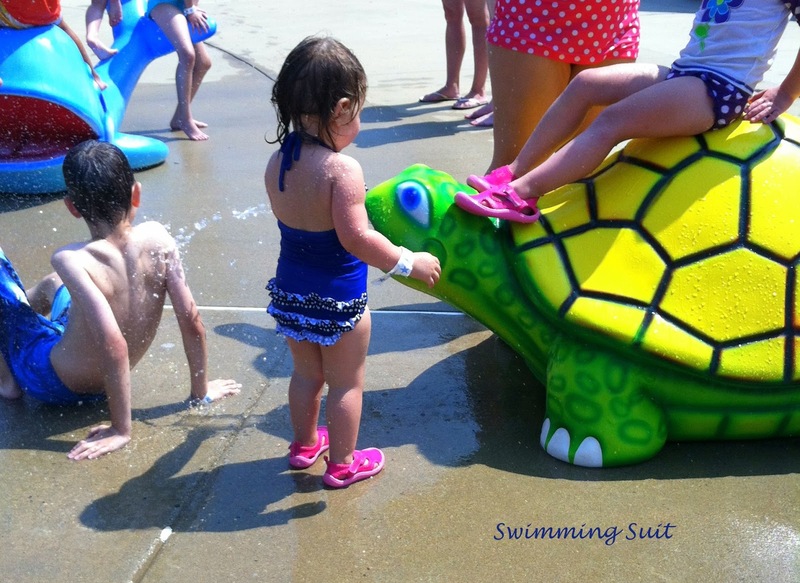 And realistically there are still a couple of weeks to get that ruffled bum to a pool, right? 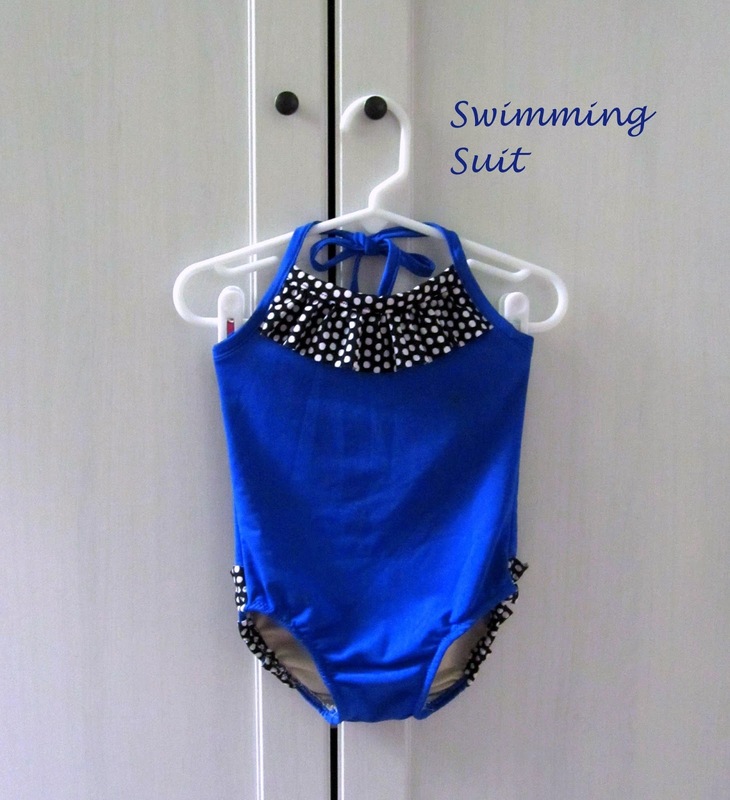 If you’re interested in making one of these swimsuits, Go To Patterns’ August discounts are 15% off your purchase of $20 or more OR 20% off your purchase of $60 or more! You can get the discount codes by clicking here and then clicking the SALE link (affiliate links). That is adorable! I love the contrasting ruffles- from a distance it looks like studs or gems. Very pretty. This is just too cute! I had to show this to Nathan. We spent a few evenings at the spray park and talked a lot about which girl suits we thought were cute and which we didn't like. Of course, now that we know we're having a boy it doesn't matter because buying this pattern is even further in the future. But I plan to copy this suit! I just love the polka dot ruffles! Cute. The colors are great. I got swimsuit material with some great intentions- I think it's going to wait for next summer. So you're ahead of me! 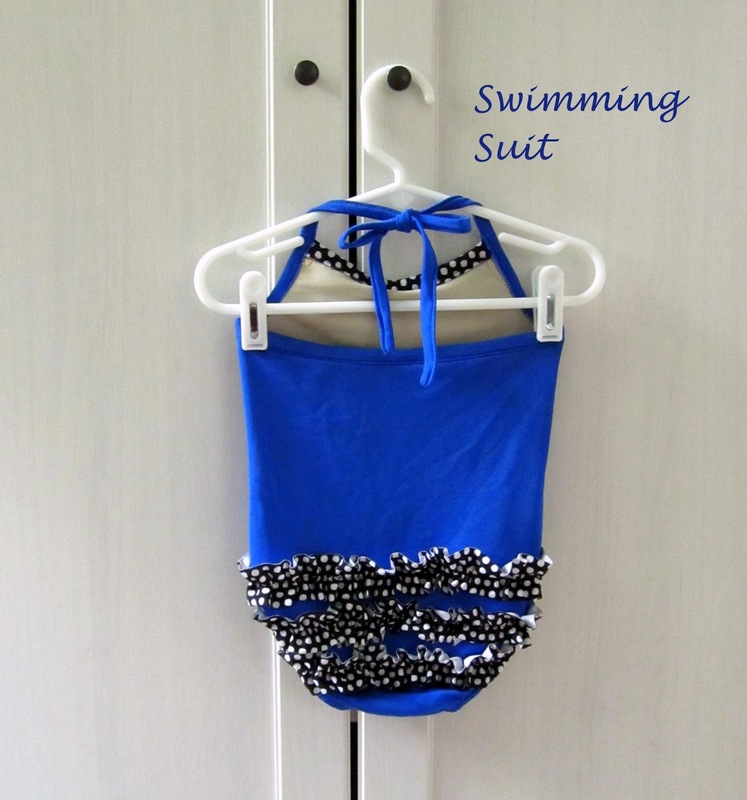 This little bathing suit is adorable!! Well done!